Curious Grace & Black Rabbit tapped into the magic and madness of the moment — the defiance, the hope, the uprising — to create #worldonfire, an album that celebrates complicated dreams, heroines and heroes in today’s Twitter-driven world. Soaring vocals, pulsating guitars, progressive arrangements and chunky riffs power their new wave-inspired melodic rock. #worldonfire takes listeners on a journey that is sometimes dark but always beautiful – like ruin and renewal – with intense electric instrumentation, driving rhythms and evocative lyrics. Listen to the complete World On Fire! #WorldOnFire is an album for this moment. It was born out of the madness and magic of living in a Twitter-driven world that can’t tell whether a dream is upside down or downside up. Curious Grace & Black Rabbit tapped into the angst… the defiance… the uprising. The result is an album that celebrates complicated dreams, heroines and heroes. CG&BR commissioned Swedish artist Mattias Gordon to create the album cover art, a wickedly clever piece of pop surrealism. Gordon also created the animation art for Curious Grace’s 2013 release of Blue Umbrella (an earlier formation of Curious Grace & Black Rabbit). We love the Badger state! And we love our blue-leaning friends. Thank you, Ed, for sharing #worldonfire with your readers. There’s actually a story behind your favorite song, Scars & Children. Curious? 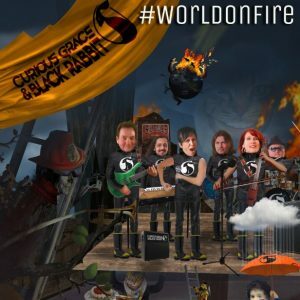 Hey Ed , thanks for the review #World On Fire , I wanted to point out we have a Badger in our Band Heidi O Toole and ask any of your readers if they could recommend any venues for our Band to perform. Because we are neighbors we would love to grow our fan base in Wisconsin.Keep up the good work ,Cheers!